Super II, simply out-performs the competition. See-Thru Strainer Cover lets you see when basket needs cleaning. All Components Molded of Corrosion-Proof reinforced thermoplastic for extra durability and long life. Heat Resistant, Industrial Size Ceramic Seal. Long wearing, and 100% drip proof. 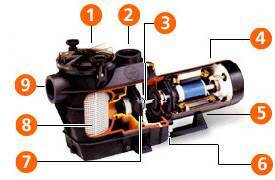 Heavy-Duty High Performance Motor with air-flow ventilation for quieter, cooler operation. Uni-Bracket Mounting Base provides stable, stress-free support, plus versatility for any installation requirement. Service-Ease Design gives simple access to all internal parts. Motor and entire drive group assembly can be removed, without disturbing pipe or mounting connections, by disengaging just six bolts. 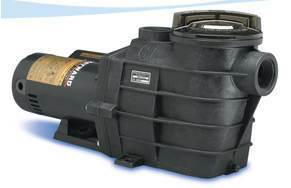 Balanced, High-Head Impeller provides high-volume output to accommodate even the most demanding installations, including pool/spa combinations and in-floor cleaning systems. Super-Size Basket has extra leaf-holding capacity and extends time between cleanings. Rugged, One-Piece Housing, with full-flow ports, assures rapid priming and continuous operation.